Trumpet players know this story all too well... To get those screaming high notes, there is a natural tendency to push the mouthpiece HARD against the chops. Often times too hard - to the point where you regret it later. Players know that more mouthpiece pressure can help to support weak or tired chops in order to continue playing. The downside is that too much pressure against the lips prevents proper blood flow, and you wear out even faster - and finally it's game over until you've had plenty of time to rest. The Warburton APE helps you learn how to maintain a high quality full-range buzz without applying excessive pressure. Spring is compressed even further by more mouthpiece pressure and the air outlet is almost closed. Buzzing is starting to get very difficult because of the back pressure. 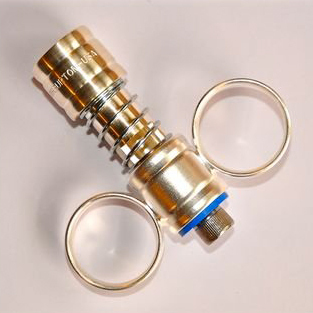 Too much mouthpiece pressure has compressed the spring enough that the air outlet is closed. Buzzing cannot continue until you reduce the mouthpiece pressure enough to open the air outlet hole. Currently, APE is available for Trumpet players. Other sizes for the French Horn, Cornet, Trombone, and Tuba are in development and should be available for purchase sometime during the 2nd quarter of 2011 (maybe even sooner depending on how we can work them into the production schedule).